In a new interview, the restaurant chain's chief operating officer has it coming out as anti-marriage equality. 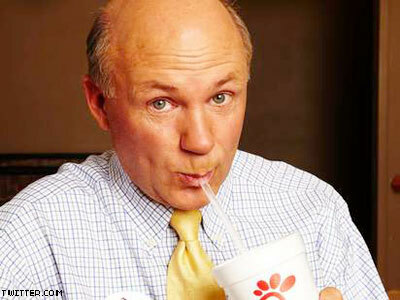 Dan Cathy, the chief operating officer of Chick-fil-A, said there is no denying that his company opposes marriage equality. Cathy said that he does not feel right billing Chick-fil-A as a Christian business because, as Christian business mentor Fred Roach once said, "There is no such thing as a Christian business ... Christ never died for a corporation." However, Cathy told the Baptist Press he aims to operate the restaurant chain "on biblical principles." When asked whether his company had an established position against marriage equality, Cathy said, "guilty as charged." He added, "We are very much supportive of the family — the biblical definition of the family unit. We are a family-owned business, a family-led business, and we are married to our first wives. We give God thanks for that. ... We know that it might not be popular with everyone, but thank the Lord, we live in a country where we can share our values and operate on biblical principles." Previously, Cathy insisted that he and Chick-fil-A were not antigay, and that his company has "no agenda against anyone." Cathy's father and grandfather opened the first Chick-fil-A in 1967 in Atlanta. Forty-five years later, the company is one of the largest fast-food outfits in the country, with 1,608 restaurants, 61,000 employees, and $4 billion in sales last year. The company has reported millions of dollars in donations to antigay groups including the Family Research Council and the Marriage and Family Foundation. Because of Chick-fil-A's ties to antigay organizations and causes, many LGBT people and allies are boycotting the restaurants, and plans to open a restaurant on the Northeastern University campus were quashed.